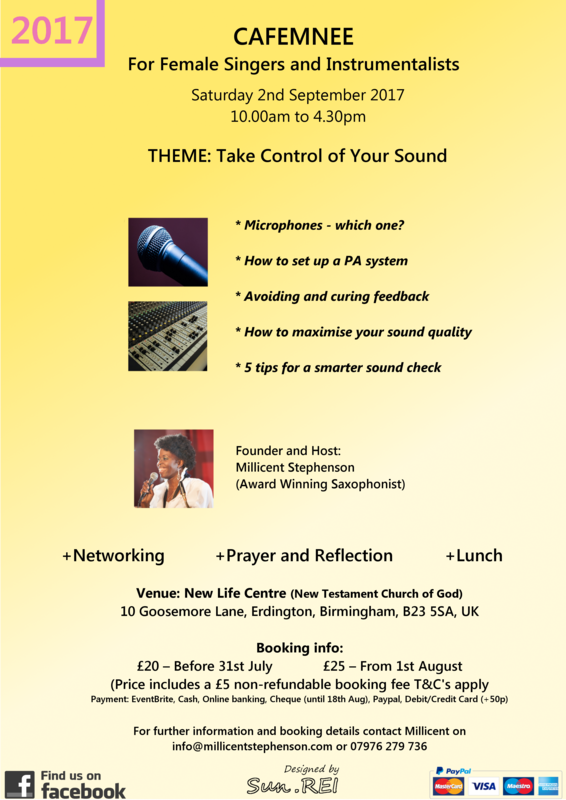 Thank you if you have reserved your place for September 2nd ‘Take The Controls’. Just reminding you and for you to tell your friends that the Early Bird of £20 for ‘Take The Controls’ ended 31st July. It is now the standard fee of £25 (from 1st August, £25). Debit/Credit card: Please call me to arrange payment. Additional fee of 50p for to transaction costs. -Fee includes a £5 non-refundable booking fee. -Full refund (except booking fee) if cancel 7 days before event start date. -No refund for cancellations made 2 days or less of the event. Change to Jam Session and Vocal Masterclass for this session only. Don’t forget, we usually have a couple of so hours to play and sing in our respective groups but this time it will be different. We will all be together. Cynthia Fearon will plan songs that we can get along with fairly quickly so that while most of us are singing and playing together, some will be learning and trying their PA mixing skills on the band and singers. We will rotate so that everyone gets a chance to have a go. Hope that makes sense. Any queries please email or call.